Some of you may have noticed that I’ve been tagging my recent reviews with #TBR20. You may have heard about this initiative on twitter, or read about it posts by other bloggers (Emma and Max have joined recently – I’ve included links to their posts. Other participants are here). In essence, #TBR20 is a way of tackling the ever-growing ‘to-be-read’ pile of books by reading twenty books you already own before buying any more. It’s Eva Stalker’s idea – you can read Eva’s original post here. Eva started her #TBR20 in November with the aim of finishing by the end of March – you can read her latest post here (one month on from completing her twenty). Like Eva, I already owned more unread books than I knew what to do with, so I decided to start a round of #TBR20 at the beginning of December. By the first week in April, I’d finished reading my twentieth book, Clarice Lispector’s Near to the Wild Heart (not my favourite book of the twenty, but an exhilarating read nonetheless). If you’re interested, here’s a picture of my twenty books (well, nineteen of them as I read Mary Costello’s Academy Street on kindle). One month on from finishing my #TBR20, I thought it would be useful to jot down a few notes on how it worked for me, partly for my own benefit but also because it might be of interest to others. 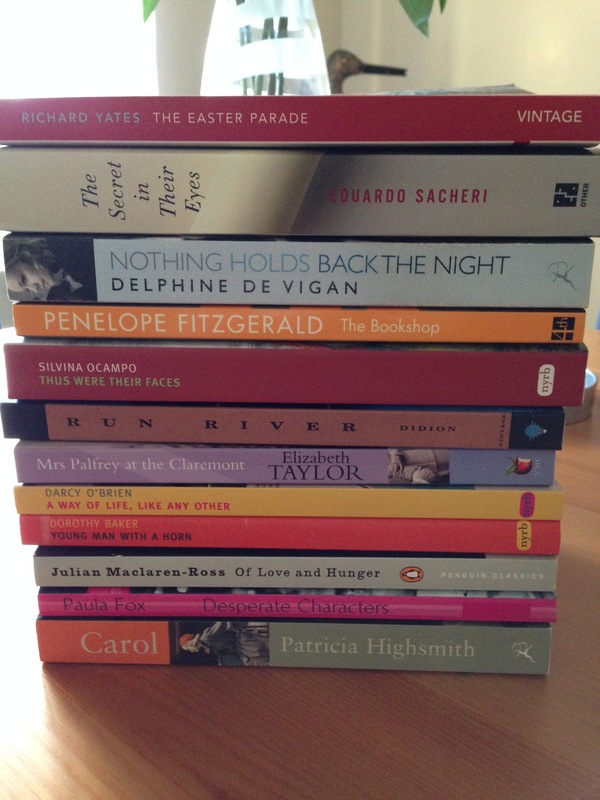 From the outset, I decided to pick my twenty books as I went along. I had a ‘draft’ set of twenty books piled up on the bookshelf, but I tinkered with it every now and again. My reading tends to be driven by my mood; I need variety, a change of pace or tone. I want books that take me to different periods and places. There are times when one book leads to another, something with a similar idea or theme or an interesting contrast. I found this relatively easy to manage by maintaining the flexibility to move a few books in and out of the pile. This approach came into its own when I reached the end of January. I hit a difficult period at home. A mysterious pain appeared on one side of my body and refused go away. A protracted sequence of tests, hospital visits and periods of uncertainty followed. I’ll spare you the details, but it turns out that I have a crack in one of my ribs, a fracture that is taking some time to heal. It’s still there, and it’s rather painful. Out went a few challenging or intense books; in came a few books I just knew I would enjoy. Novels like the warm and affectionate A Way of Life, Like Any Other by Darcy O’Brien; an escape to 1950s LA in the form of Raymond Chandler’s The Long Good-bye; and the comfort of rereading a favourite novel, A Heart So White by Javier Marias. (I checked with Eva, rereads are in line with the spirit of #TBR20 – it’s about valuing the books you already own even if you’ve read them before.) All three turned out to be terrific choices. I also decided only to count the books I intended to review, mainly to tag and record them on here. In addition, I excluded a couple of review copies which I read and posted about while I was doing #TBR20. Library loans (which I used for books chosen by my book group) were also excluded. All in all, I ended up reading 24 books from my TBR/reread shelf (20 reviewed + 4 not reviewed), two review copies and two library loans. You can find links to all my reviews in this index here, or you can click on the #TBR20 tag at the bottom of this post. So what have I learned from #TBR20? Well, I’ve rediscovered a sense of excitement about the books I bought many months or years ago, several of which were personal recommendations or purchases prompted by other bloggers’ reviews. My original ‘draft’ twenty did not include enough crime, hardboiled or noir to satisfy me; that’s where I would have struggled had I not made at least one tweak. I don’t feel attracted to the new releases just because they are ‘new’. I still crave books, but the ones I want to buy tend to be older releases, backlist titles by some of my new favourite authors (Elizabeth Taylor, Penelope Fitzgerald, Joan Didion, Ross Macdonald and Javier Marias spring to mind) or other reissues that have caught my eye. I have missed the enjoyment of browsing in bookshops. This has been the biggest challenge, to keep away from temptation. I allowed myself just one visit to a bookshop during the four months of #TBR20, a trip to the new Foyles. Time for a small confession. It was my birthday in March, and I cracked – I used a birthday book token to buy myself a little something: A Month in the Country by J.L. Carr. I nearly read it that very week, but it’s sitting on my bookshelf for a late summer treat. I just know I’m going to love it. When I started my #TBR20, I set up a new wishlist for the books I wanted to buy. By the beginning of April, there were twenty books on that list, and that’s following a couple of rounds of pruning. I had intended to allow myself six new books, but temptation got the better of me and I ended up buying twelve (eek! ), the others remain on the wishlist. 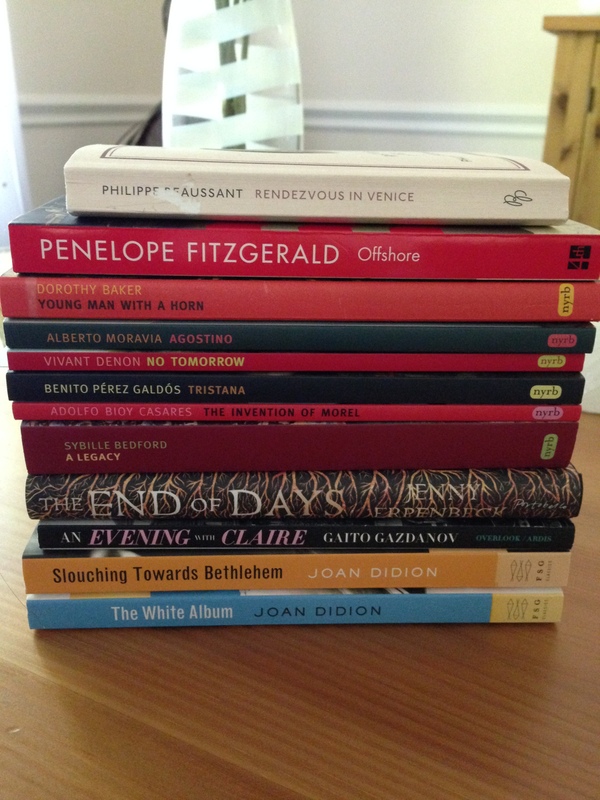 Here they are – as you can see, I’ve gone a bit NYRB Classics crazy. I’ve already read three of them, all fantastic: Philippe Beaussant’s Rendezvous in Venice, Dorothy Baker’s Young Man with a Horn and Alberto Moravia’s Agostino (reviews to follow). I intend to keep the others for a while; they have joined the ranks of the great TBR. I need to carry on with the spirit of #TBR20, of valuing the books I already own rather than allowing myself to be distracted by the next craving. I’m not sure if I can go another four months without buying ANY new books; it might be a little too soon after the first round. As an alternative approach, I’m going to try to cut back on buying books (especially now that I’ve had a splurge). I’m still thinking about what might work for me over the next few months. Possibly a TBR10 or a ‘Three Out, One In’ approach? Maybe I’ll try a TBR10 and see how I get on. If it works out, I might push on through to another twenty, but I’ll need to choose the books I want to read as I go along. I know that much. There are still a good 200+ unread physical books (and around 50 e-books) in this house, so there’s plenty of scope for me to appreciate the ones I already own. Good luck to those of you who are doing the #TBR20. I hope my thoughts are of some interest – do let me know your thoughts on #TBR20, tackling the reading pile or on any of the books I’ve mentioned. All are welcome. Belinda Farrell has also posted her thoughts on finishing #TBR20 here. 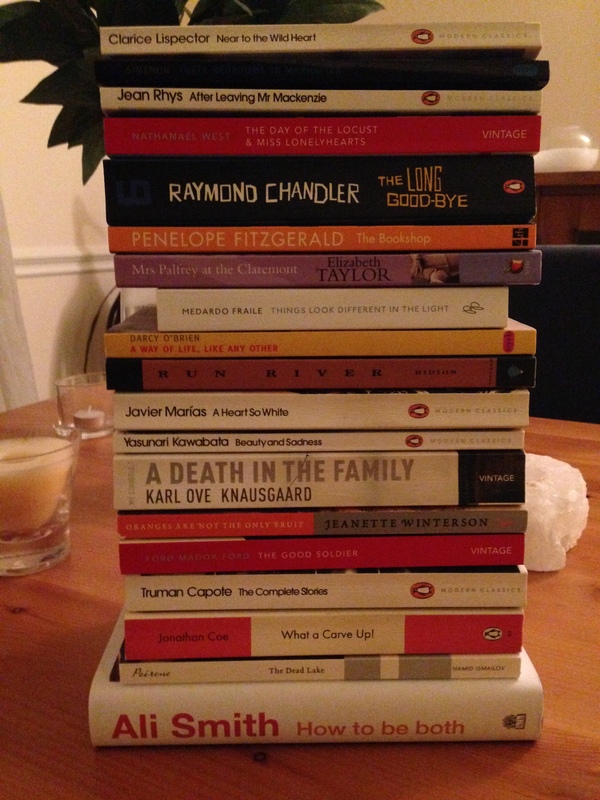 This entry was posted in #TBR20, Book Reviews and tagged #TBR20, Book Review, Clarice Lispector, Darcy O'Brien, Elizabeth Taylor, Fiction, Ford Madox Ford, Javier Marías, Jean Rhys, Joan Didion, NYRB Classics, Penelope Fitzgerald, Personal, Raymond Chandler on May 15, 2015 by JacquiWine. Darcy O’Brien was the son of actor George O’Brien (star of several silent films and 1930s Westerns), and stage and screen actress Marguerite Churchill, a frequent co-star of John Wayne. A Way of Life, Like Any Other, is Darcy’s semi-autobiographical novel inspired by his experiences of growing up in Los Angeles in the 1940s and ‘50s. It’s a terrific novel: part compassionate satire, part touching coming-of-age story, and another absolute gem from NYRB Classics. Guy and Max have already written such great reviews of A Way of Life that I doubt whether my thoughts will add much to the discussion. But if nothing else, I hope this post might encourage one or two other readers to take a look at this noteworthy book. As the novel opens, the unnamed narrator recalls the idyllic days of his early childhood years living with his mother and father at the Casa Fiesta ranch in Malibu. His father is a famous actor, in demand for films and personal appearances, and the family are living the high life enjoying all the benefits that success can bring. The dinner parties were amusing unless Mother allowed herself to get too drunk before they were well under way. I would act as bartender and I would know it as a sign of trouble if she took little drink from me, because that meant she was swilling in the kitchen. Guests praised my highballs and martinis and wondered that a twelve-year-old could attain such skills. Mother embarks on a search for the perfect man, the love of her life, a man who can finally make her happy. Men come and go, some stay longer than others, but none of them seem terribly suitable. Guy’s review contains a wonderful quote on a couple of the contenders: the father’s handball partner (a short-term player) and the guy who invented the Hawaiian shirt (he lasts almost a year). O’Brien has a great ear for speech and dialogue, and that’s just one of many quotable passages in this novel. The narrator’s Granny wears the trousers; she has a hard heart and resents the boy’s presence in her house. Things look up though when a high-school friend, Jerry Caliban, invites the narrator to come and live with his family in Beverley Hills. Not since his Casa Fiesta days has the boy experienced such a warm and loving family living together in joy and harmony. The Caliban era is one of my favourite sections in the novel; it’s full of sketches of the Caliban’s house, their lives and habits. Mr Caliban is a movie director, a friendly guy with the common touch. (He started small and worked his way up.) When the narrator arrives at the Caliban’s house in Beverley Hills, he can tell they have money. Mrs. Caliban has an allowance of $25,000 a year just to go to the horse races. O’Brien’s description of a Thanksgiving trip to Las Vegas is another highlight from this section. Mr. Caliban sweats it out in a thirty-hour non-stop gambling session; it’s a pivotal episode. In the final stages of the novel, the narrator moves back in with his father. Granny has died, and father has neglected the house allowing it to go to rack and ruin. There are some touching scenes as the teenager helps his father get to get back on his feet, and a sense of camaraderie develops between the two. The old movie star still holds out some faint hope of going places. A Way of Life is a wonderful novel – it’s funny, sad, ironic and sympathetic. In many ways it reminds me of early-to-mid-period Woody Allen (you know, the good ones). At one point during the narrator’s Paris trip, there’s a terrific vignette of a married couple arguing over the task of mailing their postcards home. I could visualise it in an Allen movie. The writing is note-perfect (Max’s review includes some great examples of the author’s playful use of language). Despite the horrors of the boy’s childhood, the early chapters are warm, compassionate and full of humour. The warmth also comes through when the narrator falls for Linda, an attractive girl he admires during English class. As the boy matures, the novel’s style and tone develop too. The final chapters covering the boy’s teenage years are tinged with anger and bitterness. He sees his mother for what she really is, a self-interested wreck who has failed to live up to his hopes and dreams. Towards the end, the narrator feels trapped by his father’s desire to cling on to the past, a wish to relive the memories and fantasies of years gone by. I’ll leave it there as I want to avoid saying anything more about the finish. A Way of Life is one of my favourite novels of the year so far, a near certainty for my end-of-year list. 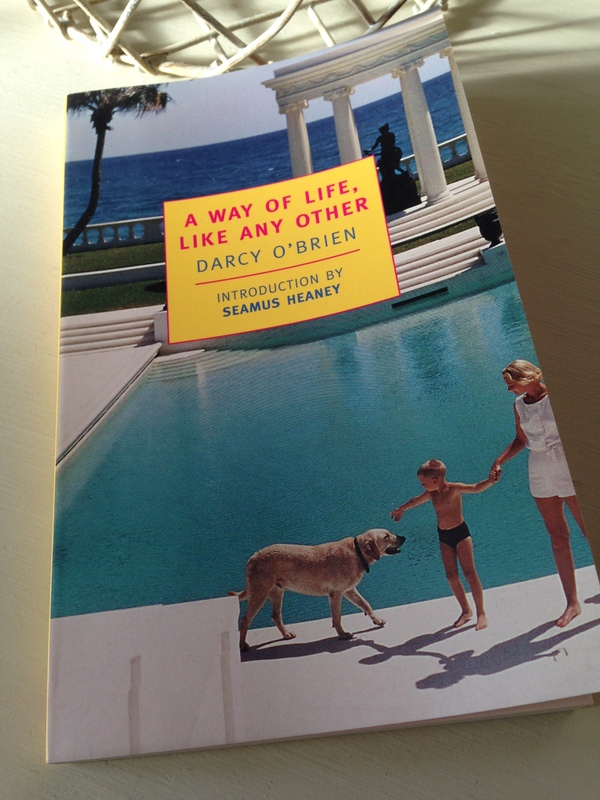 A Way of Life, Like Any Other, by Darcy O’Brien is published in the UK by NYRB Classics. Source: personal copy. Book 12/20 in my #TBR20. This entry was posted in Book Reviews, O'Brien Darcy and tagged #TBR20, Book Review, Darcy O'Brien, Fiction, NYRB Classics, US on April 15, 2015 by JacquiWine.